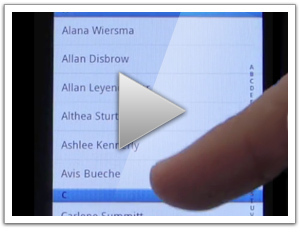 There’s notably difference between your video and me on my iPhone 4 trying out the orientation change of the buttons page and click on a list item. The orientation change looks actually just as on the left side of the video (the 1.1 example). +1 for “Probably the biggest thing now is getting routing/deep linking back into the framework”. Is Sencha Touch 2.0 going to include the same base as ExtJS 4 so we can start writing mobile/desktop views on top of the same models and controllers? Hi Ed, please tell me that we have the filter option on the nestedlist? I (foolishly), saw something on lists and stores whilst reading the various documentation and assumed I could use filters, so started developing my application around that. The I discovered there are no filters for it? Seemed strange to me for what it is, so I was hoping this new version would help and save me loads of time and grief. Not to mention rework.